The profile of Russia’s Air Force (Voyenno-Vozdushnye Sily, VVS) is one that has not evolved much since the end of the Cold War. Due to the fact that Russia is a nuclear power, there are aspects to the missions that the VVS must be capable of performing that are not a consideration for most other air forces in the region. Russia maintains a tactical air arm that is capable of supporting combined arms operations, as does any nation with a credible armed forces establishment. Tactical aviation is an important part of Russia’s air power portfolio, but it is not the only asset that Moscow has at its disposal. Included in the Russian armed forces are a strategic air wing responsible for carrying out intercontinental-range missions, plus a carrier air strike group deployed aboard the Admiral Kuznetsov. Neither of these types of aircraft are in the usual range of requirements for a conventional European NATO-nation air force. On the surface, having these extra assets of strategic strike and power projection would appear to give a nation added capability to defend itself and carry out a wide range of military missions. But, the reality is that no one in the Russian defence establishment is really engaged in the type of inquiry that one would expect a quarter of a century after the end of the Cold War. Both the strategic bomber fleet and the carrier air wing were capabilities that were deemed necessary in order to maintain parity with the US and NATO in the event of a nuclear conflict. The strategic bomber was to deliver nuclear tipped ordnance on target, while the carrier created an extension of the then-Soviet Union’s air defence network of interceptor aircraft that could shoot down American bombers en route to targets in the USSR. Neither of these missions seems like they should be priorities for Russia’s air power planners, and yet the country has now committed to building not just one – but two – strategic bombers in the coming years. A next-generation project, the Perspektivniy Aviatsionniy Kompleks – Dalnei Aviatsii (PAK-DA) was supposed to enter into the prototype construction phase within the next year, but again without any real evaluation as to the real-world requirements for such a platform. More recently, the Russian Deputy Defence Minister for Procurement, Yuri Borisov, announced that in parallel with the PAK-DA’s development Russia would re-engage production of the Tupolev Tu-160 bomber, 16 of which remain in service out of the 35 built during the Soviet era. Borisov stated in July 2015 that the new version of the aeroplane would be designated Tu-160M2 and would incorporate a completely new configuration of on-board systems, with production to be underway by 2023. As a consequence of the limited facilities available to produce one – let alone two – strategic bomber platforms “the PAK DA project will be somewhat shifted beyond [the 2023 time frame], otherwise there is no sense in it” – said Borisov. This decision – to engaged in production of a modernised version of the Tu-160M2 and then move the fifth-generation PAK-DA to the right – was reportedly made by Russian President Vladimir Putin in May 2015. Moving the PAK-DA programme out of the first-order rank of priorities is clear evidence of three deep and systemic problems within Russia’s defence-industrial complex. One is that the Russian armed forces establishment remains mired in a Soviet-era mindset. That mindset has generated a set of requirements that are products of a capability-based planning process rather than current-day analysis that examines Russia’s true national security problems. The second problem is a deteriorating and shrinking military industrial complex. Most of Russia’s defence policy makers have refused to acknowledge that decades of neglect and almost no state orders from Moscow’s own military have turned the once-mighty Soviet defence sector into a shadow of its former self. Borisov seemed to show what might be the first real recognition of this situation by higher levels of the Russian government when he told the Moscow Times “the objective reasons for the failure to meet state defence procurement orders include restrictions on the supply of imported parts and materials in connection with sanctions, discontinuation of production and the loss of an array of technologies, insufficient production facilities.” However, other members of Russian officialdom continue to issue impossible-to-fulfil objectives, and an ambitious plan for re-arming the armed forces with 70 per cent new military hardware by the middle of the next decade continues unabated despite the decreasing capacity within the industrial sector. The severe shortcomings that are caused by the loss of fluency with numerous technological disciplines are a deficiency that only gets worse in Russia. Another is that many components that Russian industry used to purchase from both western nations, as well as from their historical industrial partners in Ukraine – importing technologies that no longer exist in Russia – is no longer an option. These imports are now denied to them due to the embargoes put in place in response to Moscow’s invasions of Crimea and the Donbass regions of Ukraine. While actuarial tables are one reality another is that others are being shoved into retirement for reasons of pure greed. One of Russia’s most well-known and talented military electronic system designers was told this year that it was time for him to retire. On the surface, this decision is a strange on is there is plenty of work for him to do and his design bureau has a critical role to play in developing Russia’s next-generation weapons. But, like many Russian defence R&D establishments, they reside in buildings that can earn far more by being sold off to real estate developers in Moscow than they can make off of yearly orders from the MoD. Thus there is a strong motivation by those in the Russian bureaucracy to declare these kinds of enterprises to be insolvent, push all the employees out the door and sell the land that the enterprise sits on. All of which ensures that the work of these designers will disappear into thin air. Russia’s tactical aviation industry is in comparatively better condition than most of the other sectors of Moscow’s defence industry. A majority of the export orders that were inked in the period of Russia’s economic collapse that began in the 1990s were either for fighter aircraft, air defence systems and helicopters. Not surprisingly, the enterprises that turn out these products have had a much smoother road due to the largess created by these export orders. Sales to the People’s Republic of China (PRC), India, Venezuela and others not only kept these factories running, but also provided the funding for Russia’s fighter designers to come up with a series of advanced versions of the platforms that the country inherited from the Soviet Union, as well as to initiate development of new-generation systems. Sukhoi Su-30MK series – this design began the process to develop as an ambitious modernisation of the baseline Su-27 and Su-30 family of aeroplanes. This series of aircraft are different variants of the Su-27 design that are largely tailored to specific customer requirements. Among them are fully moveable canards linked to the aircraft’s fly-by-wire flight control system, the N011M passive electronically scanning array (PESA) radar set from the NIIP design bureau, a thrust vector control (TVC) module for its twin jet engines and integration of a full complement of air-to-ground weaponry. Sukhoi Su-35 – this aircraft has become the mainstay aircraft of the VVS. There have been two orders of this model by the VVS for a total of 96. It differs from all other previous aircraft derived from the original Su-27 design. The aircraft utilises a new-generation of avionics, a PESA NIIP Irbis radar set that improves considerably on the Su-30MK series radar and a new engine, the Saturn 117S, characterised as a “deep modernisation” of the Su-27 and Su-30 Lyulka AL-31F series of engines. Sukhoi Su-34 – a bomber and attack aircraft derivative of the Su-27 design, but a much heavier aeroplane. The design is a larger air frame, a side-by-side cockpit and the ability to deliver a set of heavy tonnage and long-range air-to-surface weapons. 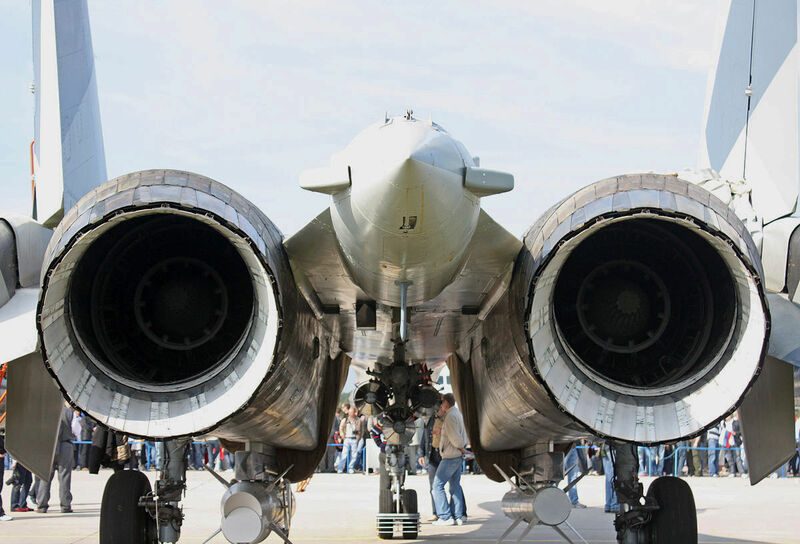 The aircraft replaces the Su-24 Fencer model aircraft that was initially developed in the late 1960s. Sukhoi T-50/PFI – the T-50 exists as several prototypes and is currently in developmental testing. The design is billed as a fifth-generation fighter aircraft that was intended to be a counter to the US Lockheed Martin F-22 and F-35 aircraft. It is smaller and lighter than the Su-35, but larger than the other major previous-generation fighter aircraft, the Mikoyan MiG-29. The “fifth-generation” designation for the T-50 seems largely undeserved, despite promotional efforts by the Russian aerospace consortium that built it. It is not stealthy, despite its shape, and it utilises the same radar and engine as the Su-35. The next-generation subsystems intended for it show no chance of being realised anytime soon. Mikoyan MiG-35 – originally developed as a proposed export model to be sold to India, this modernised version of the MiG-29 is equipped with the Phazotron Zhuk-MA active electronically-scanning array (AESA) radar and an improved engine with a TVC module. The improved design features a new central fuselage section that increases internal fuel volume to extend the aircraft’s range. There are some variations on some of these models, but the increasing dilemma for Russian tactical aviation is not its lack of clever designs, but the ability of industry to manufacture them in meaningful quantities. The production of these aircraft for the VVS (and not for export) has been in small numbers and has not ever addressed the armed forces’ re-capitalisation requirements. The air force continues to operate an aging fleet of aircraft that are ill-supplied with spare parts, part of which is why the VVS suffered a spate of crashes in the summer of 2015. Russian air power overall has a very dim future. Technological progress has few prospects of advancing and the combination of sanctions, an aging population of design talent, falling oil prices that provide much of Russia’s state revenues and the crash of the Russian ruble’s value seem to preclude anything other than a downward trend continuing. In western nations, aerospace technology and personnel talent is sustained during times of low defence spending or during other downturns by the robust business of building commercial aircraft. The Boeing company, for example, is a primarily commercial aircraft corporation and its military business is a small portion of its overall portfolio. Moreover, some of Boeing’s military programmes – like the P-8 Poseidon anti-submarine warfare aircraft or the KC-46 tanker – are commercial aircraft platforms that have been converted for military use. Russia has never had any such commercial aircraft industry for its military aircraft industry to piggy-back off of. There is literally no place for its combat aviation enterprises to turn to keep themselves in business in these increasingly difficult times. Russian air power today possesses some impressive assets and destructive weaponry, but its capability has nowhere to go but down at this point. 1. Russia is a strong military power, but the future of its air power is one of continued deterioration. These are consequences of years of neglect in funding its aerospace industry and overall economic management that has failed to provide the sustained economic activity to support the development of high-tech industries. Current next-generation programmes in development – the T-50/PFI fighter and PAK-DA bomber – are likely to never enter into production. 2. “No defence policy initiative goes anywhere unless there is industry behind it.” Russia is by no means the only guilty party in not processing this reality into their decision-making process – and not the only place where policy makers cannot be bothered to incorporate these issues into their deliberations. Even in the US, the economic dynamics of defence industry are ignored by policy makers more often than not. They fail to realise that what seem like brilliant ideas on paper sometimes fail when faced with the challenges of implementation. 3. When Poland is assessing its own long-term security considerations it needs to be concerned about the massive military might of the Russian Federation, but an adequate approach to future defence planning would be to recognise the weaknesses of Russia’s armed forces, attempt to quantify just how far these weaknesses may carry on into a state of deterioration and then develop planning options that allows Poland to take advantage of those weaknesses. Combinations of air power and other strike assets that Poland is in the process of acquiring can create synergisms that can put the Polish armed forces into a far better position vis-à-vis Russia’s military. 4. One of the challenges of the end of the Cold War was to peacefully manage the decline of the USSR so that neither political authority nor control of the nation’s nuclear arsenal descended into chaos. A similar, but potentially more dangerous challenge may now face Poland and the other nation-states of NATO. What makes today’s situation far more fraught with risk for the future going forward now is that the decline of Russia’s air power assets can only lower the threshold for the nuclear tripwire. This makes the need of Poland and other European nations to have a robust air and missile defence system all the more critical to long-term stability and survival.